If you can all stand a moment of TMI, let’s be up front about what the state of my intestines actually is post-Easter: Lined with Cadbury Cream Eggs and absolutely no regret. This year, for the first time, I did a very grown-up job of spring cleaning my apartment one unexpected night (after experiencing a surprising bout of diligence). So, I thought, why not spring clean my body? Because, let’s be honest, I’m not going to sit here and pretend my body is a temple. I like refined sugar, brie and hard liquor way too much for that. Nor am I trying to turn over a new leaf (see above reasons). And if you’re thinking a cleanse is a great way to meet an upcoming bikini deadline, forget it. It ain’t about weight loss, this was just a moment to tidy up the old digestive tract and refresh. 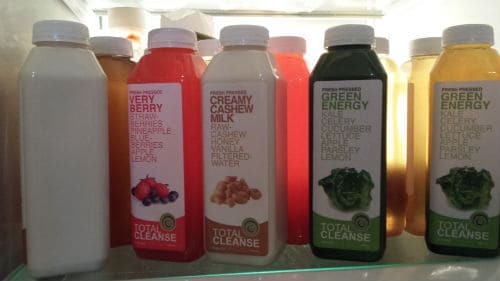 I decided to do a three-day cleanse and called upon Total Cleanse who recommended their Energize formula, their gateway cleanse (by their own description!) Six bottles a day would represent my daily recommended caloric intake. It was going to let me detox without losing any energy. Sign me up. Especially because there’s a secret weapon: not only do you supplement the cleanse with plenty of water, but David’s Tea is legit allowed too. (And I know I’m not the only one who has joined the turquoise cup cult.) 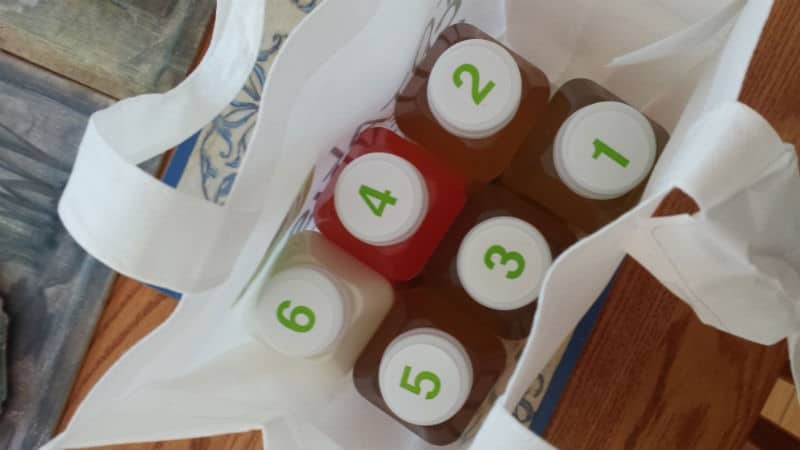 Bonus convenience cleanse clause: Total Cleanse brings the juices to you with a drop off service several times weekly, all over the GTA. I thought the toughest thing would be dealing with being hungry, but I was surprised that it really wasn’t an issue. What I struggled with was consuming that much liquid and some of the flavours. I have a lingering childhood mistrust of vegetables and shocked myself by enjoying the Green Energy juice the most. Cucumber, celery, kale, lettuce, parsley, lemon, apple and romaine on the regular. Served chilled. I did have to come to grips with the harsh realization that I will never, ever be Beyonce, though (I had hope ‘til now). 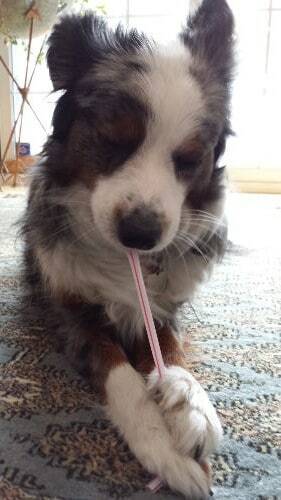 I couldn’t get the Lemonade down. Circa 2008, aka the year of Single Ladies (Put A Ring On It), rumor had it that Bey did weeks on the cocktail of lemons, cayenne pepper, maple syrup and filtered water. I tried diluting it with more water, I plugged my nose on one attempt. It was a no go, so I just supplemented those juices with more water and tea. (Disclaimer: eye-roll alert.) I finished up my cleanse and I really did feel amazing. My mad jonesing for sugar at 3pm was gone. The wheat bloat went by the wayside. I was feeling new feelings. I reached for a pear instead of a pair of cookies. The primary role of my tights returned to leg-covering instead of tummy flattening. I could’ve sworn the birds chirped a little sweeter. This lasted for one week, at which point I scarfed a cupcake for my birthday with not even the slightest morsel of regret (but some extra morsels of icing). Obviously, you need to figure out why you’re cleansing for yourself. But for me, my exercise in getting off the good stuff (Cadbury products), taking a small step on the willpower marathon and spring cleaning my body was a success. Now I know I can go wheat and sugar free for a moment, whichever moment I choose. And I bet I can do it with or without my gateway juice. Did your high school teacher ever explain the value of returning to your opening theme in your conclusion? Mine did, so one more piece of TMI: being proud of your poop is a really weird emotion. If you’re thinking about trying a cleanse, you can get a 10% discount on your Total Cleanse order using the code “shedoesthecity”!